Have any of you been noticing how smoothies and juices have become the next new "it" thing to make? Everywhere I look, juice bars are popping up alongside smoothie bars (even though Jamba Juice and Smoothie King have been around for a while here in the city). I've been seeing tons of people walking around with special bottles full of juices and extracts, as well as people at work going onto Pinterest to find the next new cleanse and breakfast smoothie. It's interesting to see how food trends have changed so much, from the giant cupcake movement in the late 2000s, to doughnuts, to juices. The world in general is moving towards more health-conscious food decisions and its impact is being felt the world over! More and more people are choosing to go organic (as well as people going down the raw and paleo diet rabbit holes). Fast food restaurant chains are offering healthier snacking and meal options. People have been rushing into stores to get either a brand new Nutribullet or a Vitamix blender. Apart from health being a common factor in all of those decisions, convenience is also being factored in; so this is where the smoothie comes in. It's an easy way to pack multiple fruit and vegetable servings into an easy "to-go" meal which takes a few seconds to blend together. Some smoothies are now including kale and spinach, while some of us are still sticking to solely fruit-based smoothies, such as this smoothie featured in the picture above as well as the recipe below. 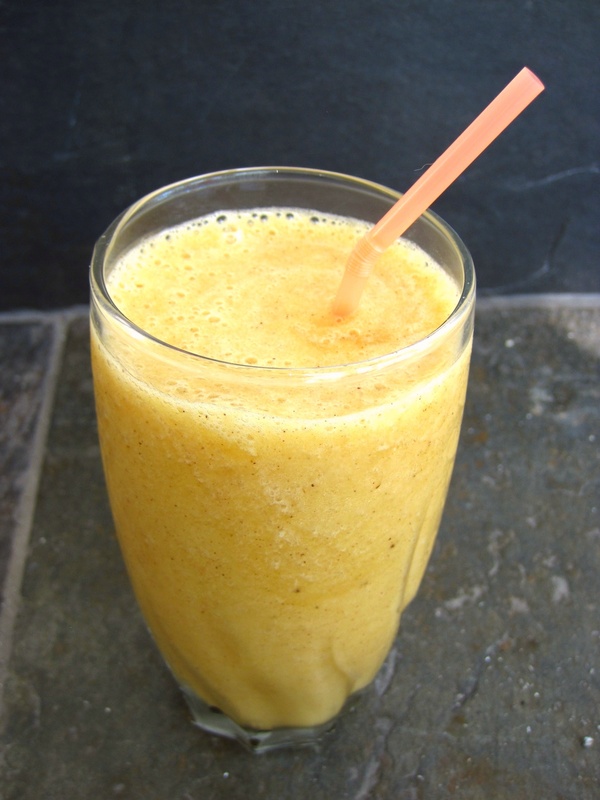 It includes bananas, peaches, and a couple of fruit juices. 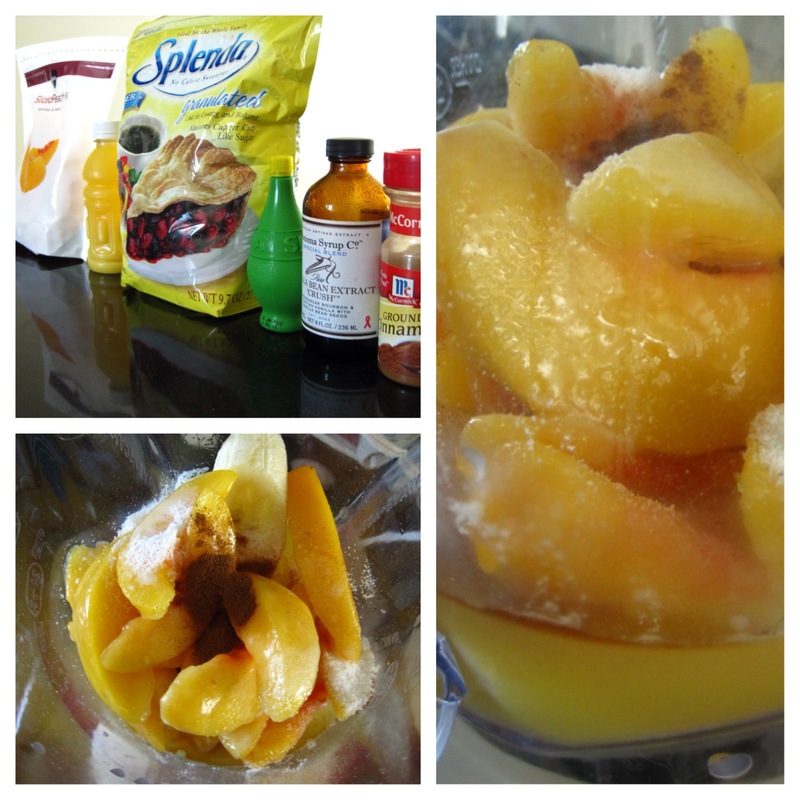 Mix into it some Splenda and a bit of cinnamon and it's a delicious and refreshing breakfast or snack drink. I had it for breakfast the other day and it filled me without making me feel like I have a food baby in the oven. It's also nice and chilly which makes dealing with the heat a bit more bearable. For those that want to make this even more health-friendly, I'm sure you can blend some ground flax seed into it or similar options without compromising both the flavor and the texture. "Here is a small change that can help your family feel healthy and happy. Replace sugar with Splenda and enjoy your favorite desserts and beverages while reducing calories and added sugars. And since Splenda has the same great flavor as sugar, no one will notice the difference!" 1) Combine all the ingredients in a blender; blend the mixture until smooth, stopping to scrape the mixture off the sides. 2) Pour into two glasses and serve immediately.